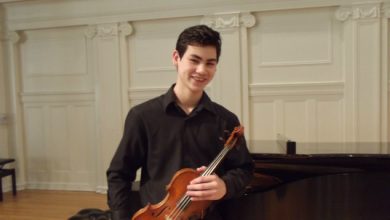 Zachary Brandon, a fourteen year old young violinist, is the Colburn scholarship recipient and a member of the Music Institute of Chicago’s Academy (MIC) program for 3 years where he has studied violin with MIC artist faculty member Dr. Hye-Sun Lee. Zachary is the winner of numerous honors and awards. In 2010, at the age of 9, Zachary became the youngest first place prize winner for the Young Artist Competition competing with musicians up to 14 years old in Fort Wayne, IN. In the same year, he won both the Concerto and the Young Artist Competition competing with High Schoolers from Kalamazoo Symphony Orchestra and Kalamazoo Junior Symphony Orchestra. Zachary made his first orchestral debut at age 10 with the Kalamazoo Symphony Orchestra as a result of being their youngest prize winner for the Concerto Competition. In 2010, he won first place for both Primary and Junior Division of Society of American Musicians (SAM). He also won first place in the Junior Division of both the Sejong and Music Chorale Competition. He is the first place winner of the Grandquest, and Confucious Music Competition. Zachary has been repeatedly invited as a guest soloist with Battle Creek Symphony Orchestra. He also has performed as a guest soloist with the Lansing Symphony and with the Toledo Symphony Orchestra as a result of being the first prize winner. In 2012, his piano trio —Trio Fantastico from the MIC Academy— advanced to the quarter final for the National Fischoff Chamber Competition. This year, his string quartet, Apollo, also advanced to the quarter finals and will compete in May. He has performed for many master classes with instructors such as Mr. Marlone, concert master for San Francisco Ballet, Mrs. Bella Keys, Mrs. Miriam Fried, Mr. Nick Eanet of Juilliard String Quartet, violinist Rachel Barton Pine, Mr. and Mrs. Almita and Roland Vamos, Mr. Van Der Sloot and Mr. Joel Smirnoff.